The Kenyan Olympic champion's time was 2min 32sec inside the official world record of 2:02.57sec set by fellow countryman Dennis Kimetto in Berlin three years ago, but will not replace that record as this multi-million dollar exercise in Italy - described as a "moonshot" by Nike, described as a travesty by many others - was not conducted under the rules of the International Association of Athletics Federations (IAAF). The red-shirted Kenyan, running behind an arrowhead of seven black-shirted pacers for most of the race as they followed the timing car, managed to maintain a pace close to his target for three quarters of the race, being only a second off at 30 kilometres. But over the final few laps of this flat, sheltered 2.4km circuit, in a race that had begun in darkness and a drizzle of rain, the human struggle at the centre of all the massed technology became clear as Kipchoge drifted away from a mark that many have equated with the four minute mile that Roger Bannister had bettered 63 years ago to the day. 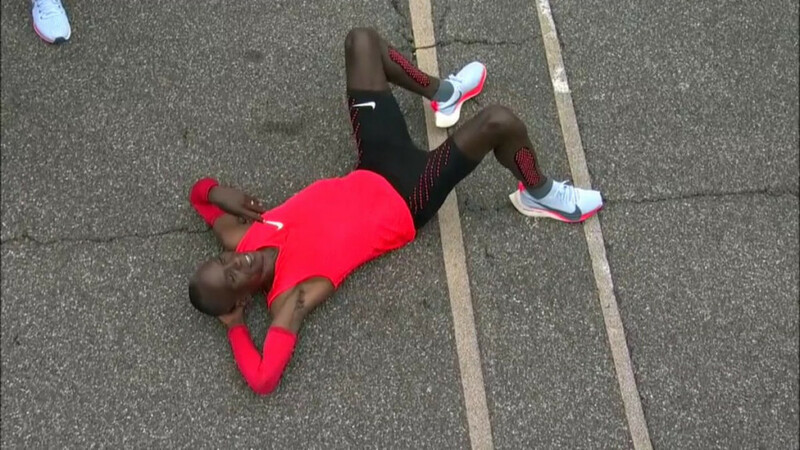 For much of the race, which was broadcast live on Twitter, the only sound that could be heard was the metronomic patter of Kipchoge’s legs, and occasional encouragements from the pacers, as an experiment that has been two years in the making, and occupied seven months of intensive effort for the three runners involved - Kipchoge, Zersenay Tadese of Eritrea and Ethiopia's Lelisa Desisa - played itself out among empty stands. Only at the pits, where pacers, rather than oil and water, were changed, did cries of encouragement come out. Kipchoge, impassive for the main part of his effort, began to betray human weakness in those closing stages, blowing out his cheeks a few times, but then relapsing back into a Zen-like smile. Only in the final few hundred metres, when the pacers dropped away and he drove his body for the chequered flag, did his expression become a grimace. Shortly after crossing the line he sank onto his back as photographers of prey gathered round him. He was up within 15 seconds. It was arguably the most impressive statistic of the day. Interviewed by the women's world marathon record holder - as we speak - Paula Radcliffe, Kipchoge's first impulse was to thank the pacers - "I thank them for giving me their bodies and their minds and their energy" - before adding: "I am happy to come this close. "With two laps to go I was a little off my target, 10 seconds. "The journey has been long, and it has been hard. "We have put in seven good months of preparation to this. "I am happy to have done this. "I think this is history in the matter of sports." Tadese, multiple world half marathon champion, also finished with a massive personal best of 2:06.51 although double Boston Marathon winner Desisa - who has a best of 2:04:45 - was lapped and tottered home in a time of 2:14.10. It put Kipchoge's fearsome effort into perspective. The Monza track was chosen because it is flat, has few energy-sapping bends and has shelter from trees lining the circuit. The 2.4km course, which the athletes circled 17-and-a-half times, made it easy for groups of pacemakers to slip in and out of the race, although this feature annulled the effort for record purposes. Hopes of an optimum temperature of nine degrees were almost realised, although it rose to 13 degrees in the later stages. In the course of this controversial project Nike have consulted experts in biomechanics, coaching, design, engineering, materials development, nutrition and sports psychology and physiology during the runners’ preparations. Debate will continue over whether the new shoes which Nike was promoting in this effort - the VaporFly Elite, which contain a curved, carbon-fibre plate in the sole which it is claimed saves four per cent in terms of running energy - fit in with the IAAF ruling that shoes must not offer "any unfair additional assistance, including by the incorporation of any technology which will give the wearer any unfair advantage". But whatever the arguments, one could not gainsay the human commitment and drama evident in Italy this morning.